Permits for each day follow in detail: Friday, December 10. 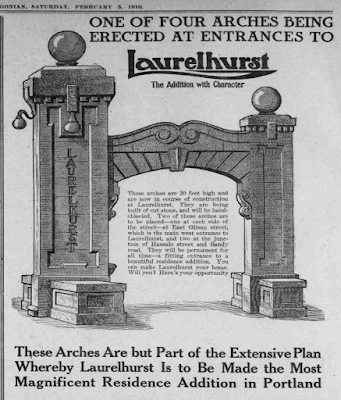 Laurelhurst Company--Erect entrance arches, East Glisan Street corner of East 33rd; builder, Philip Neu; $2000. Laurelhurst Company--Erect entrance arches, Sandy Road between Multnomah and Peerless Place; builder, Philip Neu; $2000. "During November our sales in Laurelhurst exceeded the combined sales of September and October, in spite of the fact that most of the weather was unfavorable. The rainy weather does not seem to deter people to any great extent, but during the week, when the ground was covered with snow, of course it was impossible to show the property to anyone, so business was at a standstill while the snow remained. "Activity in our property is due in a great measure to the fact that street improvements are well under way. We have 50 teams--many of them three and four-horse teams-at work everyday when the weather will permit, and if we can have 30 days more like the past week, we shall complete the grading and get a good start on the walks, pavements and other improvements.